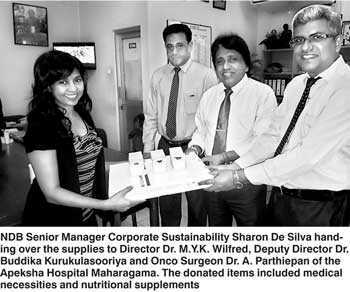 NDB recently made a donation of medical necessities and nutritional supplements to the Apeksha Hospital Maharagama as a part of the bank’s Corporate Responsibility strategies. The items donated were identified by the doctors and hospital staff of Apeksha Hospital as essentials in short supply. This donation was funded from the proceeds of the disposal of the bank’s shares which arose from the residual fractions of the scrip dividend 2017 declared by the bank in 2017. NDB has made considerable strides towards the Sri Lankan banking and finance sector, expanding and evolving a range of products and services accessible through its growing branch network. Further details on NDB’s many products can be obtained from its 24 hour Call Centre, on 011 2448888 or by visiting NDB Bank’s website on www.ndbbank.com.